18K Yellow Gold XO Earrings with White Diamonds. 18k Gold Bracelet Fully Sated in White Diamonds. 18k Yellow Gold and half Sated Black & White Diamonds. 18k Gold big open lock necklace- Fully Sated with Black & White Diamonds and a Ruby Stone. 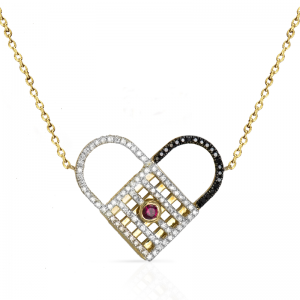 18k Yellow Gold open lock necklace- Fully Sated with Black & White Diamonds and a Ruby Stone.